And that is all. That is everything. The warm weather here in Indiana has called everyone outdoors. We live in a vibrant community, full of events and gatherings. 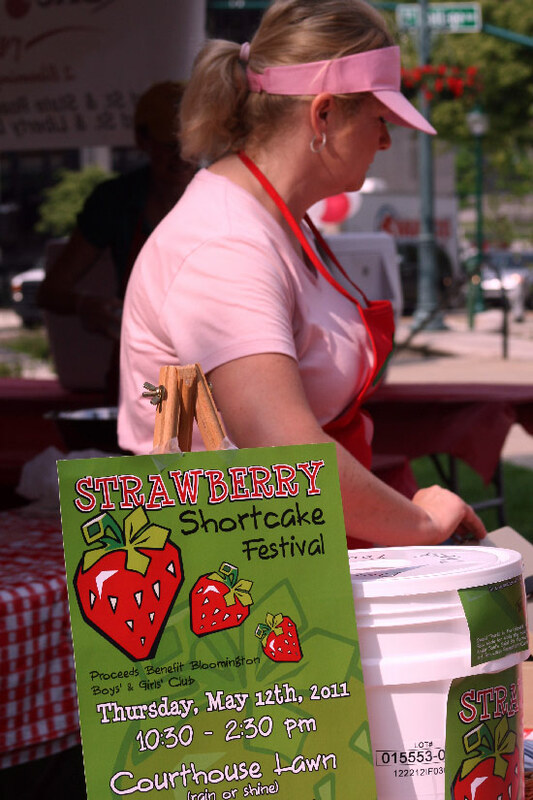 Annual Strawberry Festival, which we have attended for 4 years straight. With these new adventures, I am called to remember all of that which I practice so easily at home. Yesterday, I found myself almost snapping at the woman at the help desk who rolled her eyes at me and getting deeply uncomfortable by the man at the restaurant in the booth behind us that just sat on the edge of his seat watching people and, as far as I could tell, listening to our conversation. I found myself overwhelmed by the fast, direct energy of life. Online I have time to pause before responding. I could receive the same eye roll virtually and realize that someone may just be having a bad day. I could sense the same person lurking and perhaps invite them into the conversation, recognizing that they may have no one else to talk to. Ah, but in person? My first response is a defense, a block, an aggression or submission. They are the responses, perhaps, of an overly-sensitive person, one who feels energy of all kinds - visible and not. I'm not claiming to be a psychic or overly-intuitive...just aware. And this awareness is both a blessing and a ...challenge. It isn't that I'm a hermit nor that I have difficulties in social arenas. To be honest, I fit in quite well in most social circles. But the reason I do is because I often sacrifice myself - my truths - in order to make others feel comfortable. Through solitary practice, I have become aware that doing so does not serve me nor anyone else. While going out and directly interaction with others, however, I often sacrifice this awareness in order to maintain comfort. I am less and less willing, if I have to choose, to feel comfort over vitality. instead of the one who is afraid to be her. I also find that the more I open to this awareness - of self, of intuition - the more alive I feel. This is both an online and offline practice, one I do alone and while interacting with groups of people. I remain aware of the discomfort, the judgments - but I do not become them. I recognize them and send them on their way. While alone, I hear myself judging the painting I just made. I acknowledge it and release it. While out with others, I hear my thoughts judging the eye-rolling woman, the booth-man and plotting my response. It becomes my practice to acknowledge the thoughts and release them before they create further ripples of consequence.